Blue lily chains provide minor warding effects and are a symbol of good luck and friendship to those on good terms with fae. A popular variant of classic faerie chains, blue lily chains were created by Serpent's Hand members1 using Library-sourced techniques. These chains are often created by students of the preternatural as an exercise in imbuing items with aetheric qualities. Blue lily chains methodically attached to a favorite potted poinsettia owned by Z.S.. Foil does not have mystical significance. Nature: Blue lily chains are specially attuned to the crafter, and their friends, family, and romantic partners. The effects of the chains are stronger when given to someone the crafter or custodian cares about. The use of blue lilies in these faerie chains has a particular occult significance to the original developers, which shall not be noted here7. History & Associated Parties: This particular style of faerie chain was developed by Serpent's Hand members, which makes these chains potent sympathetic magic tools for members of the Hand. Faerie chains in general have a long history — it's said that the first were created when the first humans met the first faeries in friendship, in time immemorial. Approach: Blue lily chains are considered "Steadfast" in Loyalty8, because their effects will only manifest for a single individual, and must be passed on willingly to transfer the effect. The chains can be passed only to someone the custodian cares about, or has at least some sympathy for.9 Only the crafter can pass on the blue lily chains the first time. To benefit from the effects of the chains, hang them as decorations in a stationary area that has meaning to you — such as within your home, a favorite social location, or even a place outside your home where you sleep. 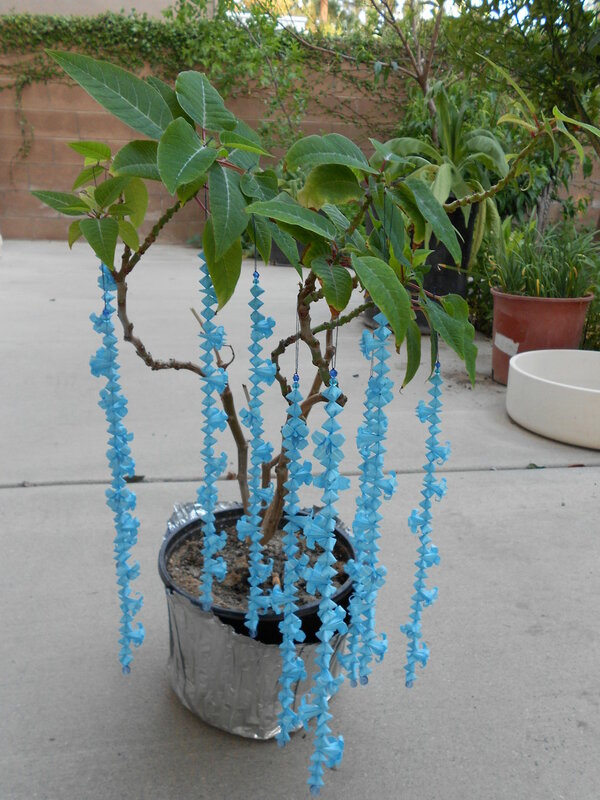 You can also use them to decorate something that is portable, especially if living.10 Some people in the Library bring blue-lily-chain-decorated plants with them to reading rooms. You can also wear them on your person, as a bracelet or circlet or necklace. A small cluster of fairy chains can provide an exponentially useful effect, though wearing too many of them on your person will not provide much benefit. Other Detail: Similar chains and garlands are used across the world, with or without magical connotations — though, more may have this significance than are remembered by those using them. See "Faerie Fire" and "Never Servants, Walkers In Light" for a great deal of excellent information on the history and usage of faerie chains. My complaint is simpler: must we bear such excess focus on the "aesthetically pleasing" magical creations? Shamble-crafting is just as useful a practice for prospective thaumotologists. This will simply lead to excessive conflation of 'magic' with 'beauty', not to mention encouraging too many of the frivolous to partake in our ancient art. —S.D.N. Jesus, is all this really such a bad thing? If the "frivolous" want to be "thaumotologists", is that really such an issue? You guys. —Iris J. Just ignore the old fogey occulists, guys. We may be stuck with the ones not human enough to join up with Big Brother — that's the Global Occult Coalition, to those of you just joining us — but that doesn't mean we have to listen to them. We're the Serpent's Hand. We're about spreading knowledge, not hiding it. —Iris J.
Oh, yeah, because the whole Garden thing would've worked SO much better if the Serpent decided to hand over the fruit of the tree of knowledge of good and evil if and only if Eve could travel through all of the First Nine Worlds, complete a diary about her pilgrimage through the Ravelwoods, solve a series of logic puzzles and get three Ph.D.s in navel gazing. Would that be enough to satisfy you, oh High Mage of the Raven Eye? —Sier N.
…okay I'm suddenly thinking Raven-Eye has a point. We should kick Jack Peterson III out of the Library. And probably Jack Petersons I and II with him. Something all sides can agree on! —Sier N.
Jack Peterson III: The very fact that you are asking that question shows your basic lack of knowledge. Is this your first day in the Library, little whelp? You are a symptom of a cancer too great to be expressed in these small words. In response to Iris J.: We're not about hiding knowledge unless we have to be, I should point out. There's a time and a season for everything and for everything a time and a season, if you'll pardon me butchering Ecclesiastes. —M*. There was a time when you would not go up the misty mountain nor down into the glen for fear of offending the many little men. Now your cities are old, your people grow too bold and all that's for us are the little lily chains. Your arguments offend, and here they must now end. Cease your bickering. Stop the fight. Turn off the computer and turn out the light. Did ye forget that we were abandoned when the Christians came? The treaty-bond withers without the chains. If you abandon the fae when we are extinct you'll have yourselves to blame.—Ps. Bsm. 1. See Watanabe et al "Developing an educational fairy chain for fun and profit". 2. Note this is only a 'helper' effect, it only helps if you want it to or don't mind; an outright mind control effect would be taken very seriously! 5. A 5% reduction in good feelings is terrible, you feel every percentage lost. 6. When woven with certain crafting techniques, the chains may even cause minor harm to the thief, or work as a distant focus for certain effects. 7. Aside from us noting that we aren't noting it. Gotta preserve the mystery. 8. Loyalty terms proposed by Z.S. 9. For example, they can be used to provide minor protection for someone you don't really know, but like or sympathize with. 10. The example in the illustration above uses a much-loved potted plant as an expert example. 11. Yes there is. See "The Impact of Fairy Jinxes on Pork Futures" by E.B. White for starters. 12. Yes, "Men" instead of "Humanity" or "People". It's an old title written by crappy monks. What can we say? It's alliterative at least, I guess. —Iris J. 13. "The Children of Light" references fae, particularly faeries (partly as the terms are often used interchangeably in classic as well as recent texts); "The Children of Dust" references humans. Old, traditional names. 14. Third Chapter, Violet Lantern Waystation, Los Angeles, California. 15. Not the Z.S. who wrote the metaphorical book on Apparatuses! I guess I'd be Z.S.S.? I'm not sure why signing off with initials is so popular.